Extensive damage was caused to the waste management facility but fortunately there were no serious injuries or fatalities. The cause or causes of this explosion and subsequent fire currently is unknown and the Belgium Authorities are investigating. At the Antwerp waste management facility, highly flammable and flammable liquid wastes would have been stored in large quantities in tanks, IBCs, drums and containers. Obviously the investigation will focus on the flammable substances involved in the explosion, how and what led to an explosive mixture within the explosive ranges, potential ignition sources that ignited this flammable mixture and the site’s safety management systems, procedures and resources. Flammable liquid waste poses an explosion and fire hazard. Gases, vapours, mists and dusts are all flammable substances which under certain atmospheric conditions have the potential to cause an explosion. An explosion occurs if a flammable substance is present in mixture with air or another oxidant (i.e. sufficient oxygen), within the explosion limits, together with a source of ignition. In addition, if the vapour, gas or dust cloud is contained, the rapid release of heat and gas causes a pressure rise or over-pressure explosion. For explosions to occur the fuel to air ratio (%) has to be in a range, between the Lower Explosive Limit or LEL and the Upper Explosive Limit, known as UEL. – Lower Explosive Limit (LEL) – if the fuel to air ratio is too small the mixture will not ignite, not enough fuel in the mixture to support combustion. – Upper Explosive Limit (UEL) – if the fuel to air ratio is too large the mixture will not ignite, saturated fuel mixture, reduced oxygen. Oxygen enrichment decreases the LEL and increases the UEL. For Higher Temperature, LEL is lower and UEL is increased. Increase of Pressure, will increase both LEL and UEL. 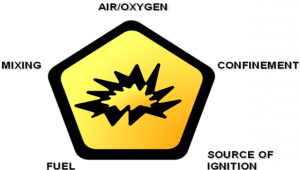 Due to the potential for an explosive atmosphere, hazardous ar ea classification (ATEX Zoning) is used to identify where special precautions are required to prevent sources of ignition. 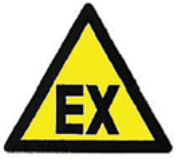 Areas where an explosion hazard is present must be clearly identified using appropriate prescribed warning signage. Hazardous places are classified in terms of zones. These zones are based on how often and for how long the explosive atmosphere occurs. The mitigation of the detrimental effects of an explosion so as to ensure the health and safety of workers. Are dangerous substances used, stored and/or generated? Are potential hazardous scenarios and activities present? Can the dangerous substance be released? Can the release result in explosive atmosphere? For more information on ATEX Consultancy please do not hesitate to contact our CMSE Consultants by email at [email protected] or by phone at 021 4978100. CMSE Consultancy provides an ATEX consultancy, training and support service to our clients nationwide. We have extensive ATEX experience and a proven track record in providing these services across many industrial sectors.